Gordon Gekko, played by Michael Douglas, stands in an executive suite in the 1987 film Wall Street. BROOKE GLADSTONE: And I'm Brooke Gladstone. Per Hansen is a professor of business history at the Copenhagen Business School and the co-author of a new study, “Making Sense of Business and Community in Hollywood Films, 1928 to 2016,” films that sound a little like this. LINUS (SABRINA): So a new industry moves into an undeveloped area, factories go up, machines are bought in, a harbor is dug and you’re in business. It’s purely coincidental, of course, that people who never saw a dime before suddenly have a dollar and barefooted kids wear shoes and have their teeth fixed and their faces washed. GORDON GEKKO (WALL STREET): Greed will not only save Teldar Paper but that other malfunctioning corporation called the U.S.A.
JORDAN BELFORT (WOLF OF WALL STREET): Let me tell you something. There is no nobility in poverty. I've been a rich man and I have been a poor man, and I choose rich every f***ing time. BROOKE GLADSTONE: From Charlie Chaplin’s Modern Times in 1936 to The Big Short in 2015, Hansen sifted through 81 films to map out the trajectory of America’s volatile relationship with the boardroom and the big board on Wall Street because, as you might have guessed, how we see the world shapes the world and how we behave in it. That's the power of film. PER HANSEN: Anthropologist Grant McCracken argues that we all have kind of what he calls a cultural blueprint, a kind of a, a roadmap for understanding and acting in the world. Films provide a kind of blueprint for the viewers to help them in a world that is very often difficult to navigate in. BROOKE GLADSTONE: You’ve divided the history of business-related films, which spans practically the history of film, into several categories. You did notice a trend from cautious idealism to disillusionment to cynicism to whatever it is we have now. PER HANSEN: [LAUGHS] Yeah, that is true. Early movies from 1928 to 1949 focus on the role of the community, on Main Street, while finance and big corporations are the villains. This is related to the Great Depression and all the misery that was going on at that time and the role of finance in the Great Depression. BROOKE GLADSTONE: The classic case you cite is It’s a Wonderful Life, from 1946. BROOKE GLADSTONE: The essential Christmas film expresses goodwill toward men through an ailing savings and loan, which has been targeted by an avaricious Lionel Barrymore who is resistant to Jimmy Stewart's passionate pleas. JIMMY STEWART AS GEORGE BAILEY: What'd you say just a minute ago? They had to wait and save their money before they even thought of a decent home. Wait? Wait for what? Until their children grow up and leave them? Until they're so old and broken-down that -- You know how long it takes a workin' man to save 5,000 dollars? Just remember this, Mr. Potter, that this rabble you're talking about, they do most of the working and paying and living and dying in this community. Well, is it too much to have them work and pay and live and die in a couple of decent rooms and a bath? Anyway, my father didn't think so. People were human beings to him, but to you, a warped, frustrated old man, they're cattle. PER HANSEN: If you are an evil capitalist, you could say, like Mr. Potter, you’re alone and nobody likes you. Peter Bailey who established the savings and loan, even though he didn’t focus on money and wasn’t a rich man, he was a rich man in a different way because he was part of this local community. And that’s the basic message of this whole film and a number of other films from the same period, these films that have taken place in the Great Depression in the 1930s, that being part of something bigger than yourself is much more important. BROOKE GLADSTONE: Now, some of these films express that view a little more didactically than others. You mention the 1954 film Executive Suite. We have a clip where the board of Tredway, a furniture company, is about to elect a new president. Don Walling, the head of production, is up against L.P. Shaw, the finance and accounts manager. At the decisive board meeting, Shaw argues that a company is answerable first and last to its stockholders. Walling disagrees. And you say this is a teachable moment. DON WALLING: Now, let’s assume, Shaw, that that you’re the man running the Tredway Corporation your way, would you be satisfied to measure your life's work by how much you raised the dividend, the four dollars or five or six or seven? Would that be enough? Is that what you want engraved on your tombstone when you die, the dividend record of the Tredway Corporation? MAN: Are you suggesting that earnings aren’t important? DON WALLING: I'm suggesting no such thing and you know it! BROOKE GLADSTONE: But then something happens in the ‘60s and the hopeful tone changes. PER HANSEN: One of the very early films that reflect this is The Apartment with Jack Lemmon. We see Jack Lemmon in a big company where meritocracy is nowhere to be found. PER HANSEN: The only reason he's getting promoted in the company is because he lends his apartment to his bosses who brings the office girls and commit adultery in the apartment. It signifies the beginning of a period of this disillusionment that grows over time in the 1960s and, in particular, in the 1970s. FRED MACMURRAY AS JEFF SHELDRAKE: Say, Baxter, you gave me the wrong key. JACK LEMMON AS BUD BAXTER: No I didn't. JEFF SHELDRAKE: But this is the key to the executive washroom. BUD BAXTER: That's right, Mr. Sheldrake. I won't be needing it because I'm all washed up around here. JEFF SHELDRAKE: What's gotten into you, Baxter? BUD BAXTER: Just following doctor's orders. I've decided to become a mensch. You know what that means? A human being. BROOKE GLADSTONE: Something else that’s marked in The Apartment and also, you say more musically in How to Succeed in Business Without Really Trying is that women in the workforce, they're treated like staplers. PER HANSEN: The point is that this is no longer a rational organization with executives that try to promote the good of society and so on. They’re only looking out for their own interests. BROOKE GLADSTONE: Mm-hmm. Well, let’s stick with Jack Lemmon then. You got Harry Stoner in 1973's Save the Tiger who wants to save his small garment factory but has a big fight with his longtime partner Jack Gilford because he decides he needs to torch it. JACK LEMMON AS HARRY STONER: What the hell else am I gonna do? Just tell me. We invented a new kind of arithmetic last year. But we survived. We kept our people working, 71 girls, 14 salesmen, secretaries, all making a living, Phil. for survival and it's called fraud. PER HANSEN: Save the Tiger is an important film. The ‘50s and ‘60s movies were to a high degree focused on the internal workings of the big organization but in the ‘70s the perspective moves outside the offices and you are also watching Stoner's private life. The television is running and it reports on all the misery going on in the world, war and materialism and consumerism, and you get the feeling that the society is falling apart. You have to look out for yourself because no one else does. He’s a decent man but he just can't figure out how to survive, and that leads him to try to have his factory burned down in order to get the insurance money. 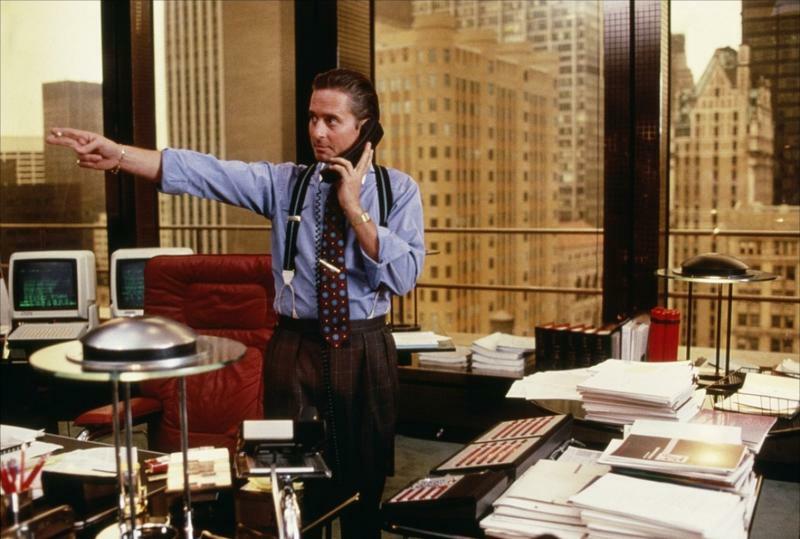 BROOKE GLADSTONE: As you head into the ‘80s, that brings us to Wall Street, Gordon Gekko. MICHAEL DOUGLAS AS GORDON GEKKO: Greed, for lack of a better word, is good. BROOKE GLADSTONE: Who wore suspenders [LAUGHS] and carries around an early cell phone [PHONE RINGS] the size of a shoebox. GORDON GEKKO: Money never sleeps, pal. BROOKE GLADSTONE: He also influences people in the real world. One of them, now a law and finance professor, decided he wanted to be part of Gekko’s world. Another guy, a young law school graduate, decided he wanted to work at the SEC to regulate him. PER HANSEN: Even though a lot of young people came to idolize Michael Douglas as Gordon Gekko, the important message is that Gordon Gekko was sent to jail. BROOKE GLADSTONE: Let us lead up to the meltdown with a film from the ‘90s, Other People's Money, Danny DeVito as Larry the Liquidator. LAWRENCE GARFIELD/LARRY THE LIQUIDATOR: Whoever has the most when he dies, WINS. Look, it’s the American way. PIPER LAURIE AS BEA SULLIVAN: He’s like something out of a comic book. PER HANSEN: Big business as you knew it from the 1950s is about to fall apart. There are new theoretical developments in economic theory that argues that conglomerates are no longer efficient, and that's where Larry the Liquidator comes in. He buys up companies and then he splits them up in separate parts and sell them off. PER HANSEN: So he doesn't really care about production. BROOKE GLADSTONE: Right. If big manufacturing is falling apart, Other People’s Money looks ahead to what the future of business is, which is basically creating financial instruments, money about money, not about staff. PER HANSEN: There is one common trait in all the movies, which is that the focus is on the bankers and that they are causing what is going on here. BROOKE GLADSTONE: And why don't we begin with Margin Call, which is a 2010 film based on the Lehman Brothers collapse? John Tuld, the CEO of a large investment bank, orders a manager to unload collateral debt obligations, CDOs, for billions of dollars to save the bank. JEREMY IRONS AS JOHN TULD: And it's certainly no different today than it’s ever been, 1637, 1797, 1819, 37, 57, 84, 1901, 07, 29, 1937, 1974, 1987 - Jesus, didn't that *** me up good - 92, 97, 2,000 and whatever we want to call this. It's all just the same thing over and over; we can't help ourselves. And you and I can't control it or stop it or even slow it, or even ever-so-slightly alter it. We just react. And we make a lot of money if we get it right. PER HANSEN: This is the big speech of the film. The difference between this film and Wall Street is that this time around no one goes to jail. Nothing happens. It just goes on and on and on, and there is nothing you can do about it. So the cynicism and the disillusionment is complete. BROOKE GLADSTONE: What do you think about The Big Short? This is probably the most entertaining explanation of what caused the collapse and who seemed to know about it and who believed they would benefit from it and who would suffer. Steve Carell plays a character who gets an inkling of what's going on. He’s sitting on a balcony overlooking Central Park, deciding whether he should cash out or walk away. STEVE CARELL AS MARK BAUM: I have a feeling that in a few years people are going to be doing what they always do when the economy tanks. They will be blaming immigrants and poor peoples. MARK BAUM: You know, once we sell, we'll be just like the rest of ‘em. You know that. VINNY DANIEL: No, we’re not. We’re not the bad guys here. We didn't defraud the American people and prey on their dreams of owning a home. PER HANSEN: Since he’s cashing in on all these derivatives, he does not follow his conscience, recognizing the fact that ordinary people, that Main Street is suffering from what is going on here. So the message is exactly the same as in Margin Call but it’s even more cynical. BROOKE GLADSTONE: Do you see another trend arising or we’re still 10 years later in the post-collapse film era? PER HANSEN: Maybe we’re not even post yet. In 2007, it was the financial world that was under threat and that ended in 2009. Then came the economic recession, and now we’re dealing with the political consequences. You can go all the way back to the Great Depression and look at the same sequence. It begins with finance. Then comes the economic depression or the recession. And then comes the political ramifications. If you think about nationalism in Europe and the US, this is part of the financial crisis that is still unfolding. BOB GARFIELD: That's it for this week’s show. 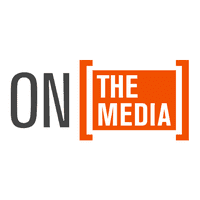 On the Media is produced by Alana Casanova-Burgess, Micah Loewinger, Leah Feder and Jon Hanrahan. We had more help from Asthaa Chaturvedi, Jackie Sofia and Samantha Maldonado, and our show was edited -- by Brooke. Our technical director is Jennifer Munson. Our engineers this week were Sam Bair, Merritt Jacob and Josh Hahn. BROOKE GLADSTONE: Katya Rogers is our executive producer. Jim Schachter is WNYC’s vice-president for news. Ben Allison wrote our theme. On the Media is a production of WNYC Studios. I’m Brooke Gladstone.